Under Australian Consumer Law extra virgin olive oil (EVOO) producers—as well as EVOO exporters to Australia—have to comply with new country of origin labeling laws that came into effect on July 1. The new labeling laws, which stipulate EVOOs imported to Australia need to display their country of origin in a text statement on labels, give exporters to Australia the option of including a shaded bar chart on labels indicating the percentage of Australian grown or produced ingredients if applicable. These laws are the result of consumer pressure following a hepatitis A outbreak in Australia in February 2015 that was linked to contaminated Australian-packaged frozen berries imported from Canada and China. According to the Australian Competition and Consumer Commission (ACCC) website, the term “product of Australia” indicates a product is produced in Australia consisting of 100-percent Australian ingredients. “Grown in” is used mainly for fresh foods and indicates the origin of the ingredients. This claim can also be used for multi-ingredient products to indicate where the ingredients were grown and processed. “Produced in” is used to indicate the source of the ingredients and the location of processing. “Made in” indicates the country in which the product was made. “Packed in” indicates the country the product is packed in. This claim is used on labels of products that have not been grown, produced or made in a single country. 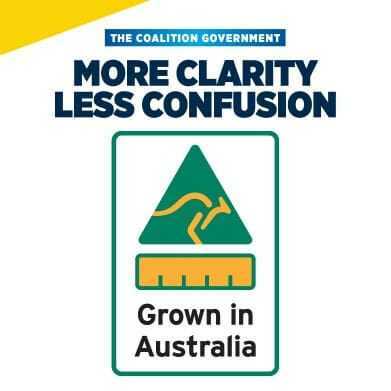 The new laws stipulate the green-and-gold Australian Made, Australian Grown (AMAG) triangle kangaroo logo is mandatory on Australian grown, produced or made EVOO labels. EVOO producers had to formerly obtain licenses from government-contracted NPO Australian Made Campaign Limited (AMCL) to use the AMAG logo. Since July 1 the AMAG kangaroo logo is no longer allowed to be used as a standalone logo on EVOO labels but needs to be incorporated into a panel on the new country of origin labels. According to the ACCC website; “non-priority” foods such as sweets, coffee and alcoholic beverages that are grown, produced, made or packed in Australia or elsewhere; are required to display a text statement on labels stating the country of origin. Even if these “non-priority” foods have been grown, produced, made or packed in Australia; they are not required to display the AMAG kangaroo logo on their labels. A bar chart on the label indicating the percentage of Australian produce, if any, in a product is mandatory on priority foods labels, but optional on non-priority food labels. The bar chart needs to be accompanied by a text statement indicating the percentage of Australian ingredients. EVOO that was packaged and labeled on or before June 30 can still be sold without the new labels. “Being a large country with olive growing occurring in a number of areas, there is an opportunity for regional identity to be developed and marketed for high-quality Australian EVOOs,” he added. “Despite being a small producer on the global scale, the extensive application of latest production methodologies and technology combined with the available area and possible regional diversity sets the Australian industry in a great position to grow into the future with a strong reputation for consistent production volumes and high product quality,” Valmorbida said.